Bring the strongest waterproof sunscreen you can find and apply it thickly to your back, the backs of your arms, ears, neck, and legs. These areas are going to be exposed to the sun a lot. Make sure they are well covered. Bring Fresh water and an antibiotic gel. Coral scratches should be cleaned and antibiotic should be applied fairly soon after the scratch. Coral puts out an enzyme that will cause infections. Don’t try to be tough and forget about it, put some antibiotic on every coral scratch and cut. Water Shoes: Bring water shoes, they help a lot. You will need to wade out in shallow water over rock, and other surfaces. It really helps to have some shoes. If you forgot your water shoes there is a small mall right across the street from the little park that is right off the beach. Cross the street from the park and follow the concrete path between the two restaurants this will take you into an open air mall. You will find a store on the bottom floor that has office supplies, books and some pharmacy items (including sunscreen), she usually has water shoes in front of her store. The water shoes I’m talking about have a thin rubber sole and nylon uppers with a string tightener kind of like tennis shoes. These provide pretty good protection and stay on your feet while swimming. Watch out for jelly fish: Jelly fish can sting. It’s best to avoid areas where you see them. Just move on to the next pool. If you do get stung the anti biotic will help. Also, while this may not seem like the ideal solution, human urine can help neutralize the stinging. Urine is sterile when it comes out, it’s pretty much the thought of having pee on you that make this treatment a little rough even though it is one of the most effective ways to treat jellyfish stings. Watch for Rock Fish: These fish actually look like a rock, you have to look for their eyes. You don’t want to step on one. Low Tide: We have found the best time is during low tide. While you can snorkel with great results at any tide, you are able to view the coral beds easier when the tide is low. During low tide you will be able to see areas where the the deep green grass like mats are actually above the water. We usually scope out the area first to locate the area we want to go to and as soon as possible start floating on our bellies to get there. You can float in just a few inches of water and you do far less damage to the habitat as well as to your feet. Float face down in the water and breathe naturally through the snorkel. If you get a little water in your snorkel you can push your head a little further under water to fill the snorkel and then raise you head so the top of the snorkel is out of the water and blow hard, this will clear the snorkel and you can breathe normally again. It takes a little practice, but once you get the hand of it you never need to lift you head out of the water. Make sure you mask is clean of all oils; this will help keep the mask from fogging. Once you have sunscreen on your hands do not tough the lens. Spitting in the lens and wiping it around also works to help keep your mask from fogging. You will find a large variety of many colored fish in the DR. Black with florescent purple spots, fish with green, yellow and blue stripes, bright yellow, bright green, bright blue, even ones like you see in salt water tanks back home. 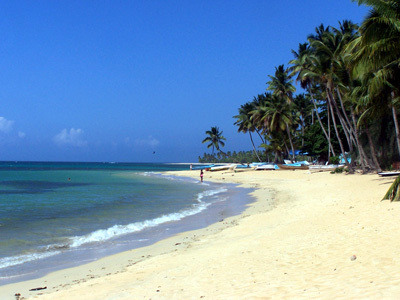 Don’t miss out on taking some time to do some snorkeling while at the DR beaches!